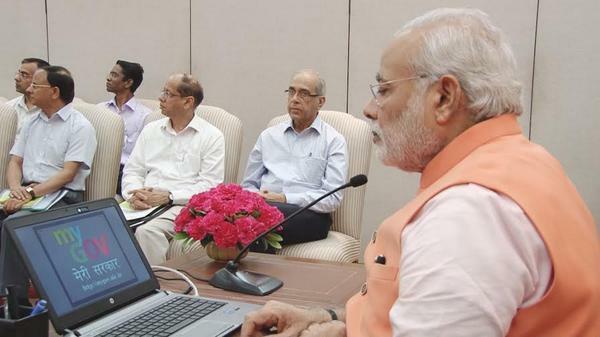 Prime Minister Narendra Modi on Saturday launched a website MyGov that aims to help citizens contribute in governance by giving their opinions and views on important issues like clean Ganga or skill development. The inauguration of the people-centric platform also marks the completion of 60 days of the new government. The Prime Minister said in the past 60 days, the experience of his government was that there were many people who wanted to contribute towards nation-building and devote their time and energy, an official statement said. Modi said MyGov (mygov.nic.in) is a technology-driven medium that will provide citizens an opportunity to contribute towards good governance, the statement added. “The platform would bridge gap gulf between people and government. Democracy cannot succeed without people’s participation in government and this participation should not be limited only during elections,” the Prime Minister said. Besides Modi, Communications and IT Minister Ravi Shankar Prasad, Cabinet Secretary Ajit Seth, DEITY Secretary R S Sharma were also present at the launch of the portal. National Informatics Centre (NIC) of the Department of Electronics and Information Technology (DeitY) will implement and manage the platform. There are multiple theme-based discussions on MyGov where a wide range of people can share their thoughts and ideas with the government, Sharma told reporters after the launch. “It is also an initiative to build a digital knowledge library. We will guide the people on the topics of national importance on which the government would like to know their views and ideas,” he added. The platform presents an opportunity for the citizens to both ‘Discuss’ and ‘Do’, Sharma said, adding, any idea shared by a contributor will also be discussed on the discussion forums, allowing constructive feedback and interaction. At present, there are six groups on the platform — Clean Ganga, Girl Child Education, Clean India, Skilled India, Digital India and Job Creation. “Citizens can also volunteer for various tasks and submit their entries. These tasks would be reviewed by other members and experts. Once approved, these tasks can be shared by those who complete the task and by other members on MyGov,” Sharma said. Each group consists of online and on-ground tasks that can be taken up by the contributors. The objective of each group is to bring about a qualitative change in that sphere through people’s participation, he said. “We will review the working on MyGov in three months and over time the number of groups, tasks and discussions will increase. The platform will also be used as a comprehensive knowledge repository,” Sharma added. The portal can even be extended to act like public audit platform for government projects like citizens giving feedback on status of completed infrastructure projects or availability of various social sector programmes, he said.